Soon after arriving at the Laboratory of Molecular Biology (LMB) Milstein began an investigation into the Bence-Jones protein. His prime objective was to understand the molecular structure behind the formation and diversity of antibodies. 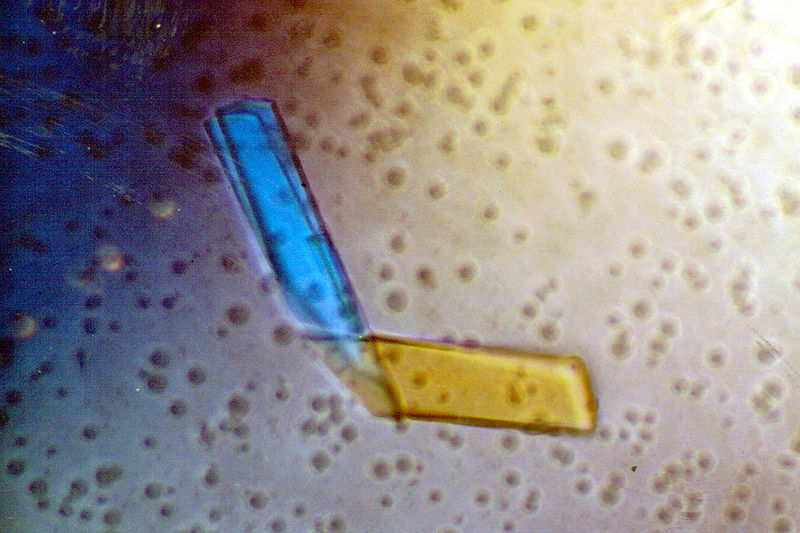 This photograph shows a crystal of a Bence-Jones protein. Photo credit: Alex McPherson, University of California, Irvine; National Institutes of General Medical Sciences, ID 2399. The Bence-Jones protein is a substance found in the urine and blood of patients suffering from multiple myeloma, a cancer that results in the softening of bones. The protein was first described by the English physician Henry Bence-Jones in 1847 and its physical characteristics were determined during the 1950s. By the early 1960s, scientists had discovered that the Bence-Jones protein possessed the same structure as a light-chain, a sub-unit of an antibody molecule. Thereafter scientists began to use the protein as a tool for investigating the structure and function of normal antibodies. One of the advantages in exploring the Bence-Jones protein was that it was easily available. Scientists could gain access to the protein collected from the urine and blood of patients in hospitals. Milstein's decision to investigate Bence-Jones proteins for the purposes of investigating antibodies was prompted in part by his supervision of a doctoral student working on antibodies when in Argentina and in part by discussions he had with Sanger on arriving at the LMB. At the start of his research into Bence-Jones proteins, Milstein was one of many scientists then trying to understand the body's immune system by unravelling the structure and function of the billions of antibodies made by the body every day to fight off infections. 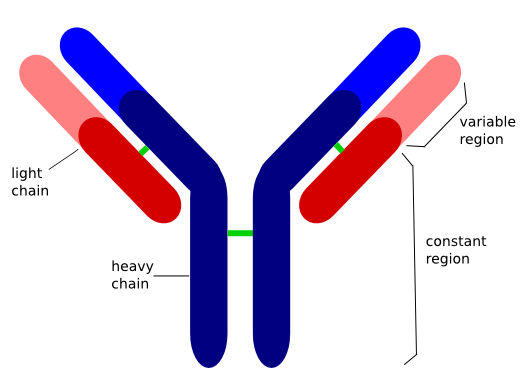 This shows the basic structure of an antibody. An antibody works by specifically targeting a foreign intruder, known as an antigen. Such antigens can range from bacteria, viruses and fungi, to pollen, dust, or food proteins that cause allergic reactions. Not all antigens are foreign bodies, however; they can also be cancer cells made in the body itself. Once an antibody recognises a particular antigen it will attach itself to a specific marker on the cell surface of the antigen so that the latter can be targeted for destruction. In many ways the binding of an antibody to an antigen can be likened to the insertion of a key in a lock. By the time that Milstein began his research into antibodies, scientists were beginning to unravel the basic structure of an antibody. This they viewed as a Y-shaped formation composed of two protein sub-units, labelled as light and heavy chains (appearing as red and blue in the diagram), held together by disulphide bonds (indicated by green lines). They believed the antibody structure was divided into two regions, one that was constant, forming the stem of the Y, and one that was variable on the tip of the arms of the Y. Nonetheless, while the basic molecular structure of antibodies was beginning to be solved, what remained a puzzle was how such an apparently almost identical group of proteins could specifically target simultaneously any one of a multiple of antigens. This specificity as well as the diversity of antibodies was a question that had intrigued scientists ever since the late 19th century when antibodies were first observed. What lay behind the heterogeneity of antibody molecules would be a recurrent subject for most of Milstein's laboratory investigations from the 1960s onwards. One of the attractions of this research for Milstein was that it could be achieved through very simple experiments, essentially comparing primary DNA sequences of two different antibodies. This gave Milstein the means to elucidate the diversity of antibodies at the level of their amino acid sequences. Having decided upon his topic of research, Milstein began investigating different chemical techniques to dissect the structure of antibodies. He was assisted by John Jarvis, a biochemistry technician who had joined the LMB when he did. Jarvis would work as Milstein's research assistant until Milstein retired. One of the first experiments Milstein conducted was to determine the amino acid sequence of the Bence-Jones protein in order to unravel the function of the disulphide linkages within the overall molecular structure of the antibody. He published his first results in C. Milstein, 'Disulphide bridges and dimers of Bence-Jones Protein', Journal of Molecular Biology, 9 (1964), 836-8. The paper provided the first sequence data for the Bence-Jones protein and was the first of the many papers that Milstein would write on antibodies over the next forty years. Having analysed the dilsulphide bridges of antibodies, Milstein began to explore the differences in amino-acid sequences, the positions of carbohydrate attachments and mutations. All of this work was directed towards understanding the nature of the diversity of antibodies at the DNA level. One of the tools that proved vital to Milstein's work in determining the structure of antibodies was the chromatography column. In column chromatography a sample is put through a glass tube filled with a liquid known to separate the different components within the sample. Because of molecule size and polarity, different components in the sample travel through the column at different speeds. 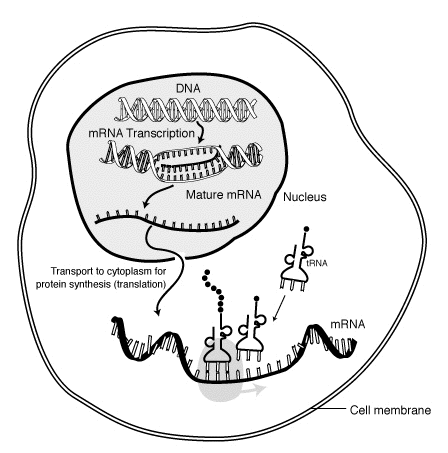 This diagram shows how mRNA is transcribed and translated into the nucleus of a cell, and then being processed and transported to the cell's cytoplasm, a gel like substance residing within the cell's membrane. Once in the nucleus the mRNA is translated and decoded for the formation of other proteins. Image credit: National Institutes of Health, Wikipedia. In Milstein's experiments, the chromatography column was used to separate out the subunits of light and heavy chains and other components of the antibody protein. Once put through the column, the separated components of the antibody were then collected and purified. After this, an enzyme was added to the collected sample in preparation for sequencing. This enabled digestion of the sample to separate its constituent elements. After being treated with an enzyme, the sample was run again through a chromatography column. Together these steps enabled Milstein to begin to determine the sequence of individual genes and larger genetic regions within the antibody. Overall the sequencing of an antibody's amino acids was a laborious and time-consuming process. The procedure would become much easier and faster with the development of new sequencing methods in the early 1970s. In his elucidation of antibody diversity at the level of amino acid sequences, Milstein was aided by Richard Pink, his first English graduate student, and Blas Frangione, an American postdoctoral scientist. He was also helped by his wife Celia, with whom he published a joint paper in the Journal of Molecular Biology in 1970. By the early 1970s Milstein had begun to shift his research towards investigating the role played by messenger ribonucleic acid (mRNA) and the encoding DNA in determining the diversity of antibodies. The mRNA is a type of chemical 'blueprint' for a protein product. One of the people Milstein worked with to understand what lay behind antibody diversity was Sydney Brenner. Milstein had been introduced to Brenner in the mid-1960s by Francis Crick, co-discoverer of the double helix of DNA and a close colleague of Brenner. Together Milstein and Brenner developed a theory to explain the phenomenon. This was published in S. Brenner and C. Milstein, 'Origin of antibody variation', Nature, 211 (16 July 1966), 242-3. At the time Milstein and Brenner wrote their article, the work of both Milstein and other scientists suggested that sequence diversity in antibody polypeptide chains was primarily located in their amino-terminal portions. The question this raised was how such localised diversity was generated. Both Milstein and Brenner hypothesised that it originated from a mutation in the DNA of the antibodies, known as somatic mutation. Somatic mutation occurs as a result of an accidental change in the genomic sequence of DNA. Such mutations cannot be passed on to offspring as the alterations of the DNA occur only in non-reproductive cells of the body. They can be caused by radiation, viruses, chemicals or errors that occur for other reasons during DNA replication. A somatic mutation can also be induced by the organism itself, through a cellular process known as hypermutation, a mechanism by which the immune system adapts to new foreign elements, such as microbes. 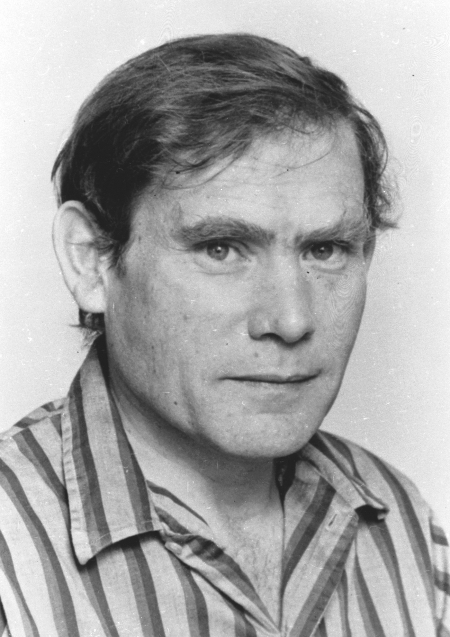 This photograph shows Sydney Brenner, a South-African-molecular biologist who in the 1960s was attached to the Molecular Genetics (now the Cell Biology) Division at the Laboratory of Molecular Biology. Photo credit: MRC, Laboratory of Molecular Biology.